Charcoal is obtained; charring or dry distillation of wood. When charring, charcoal is the only product, and in the dry distillation is one of the side. Carbonization is a physical-chemical process that takes place with the limited presence of oxygen, and heat is obtained by partially burning wood. When dry distillation, it is completely the absence of oxygen, and heat is applied from outside.In this process the wood is changing physical properties, and chemical composition to some extent. 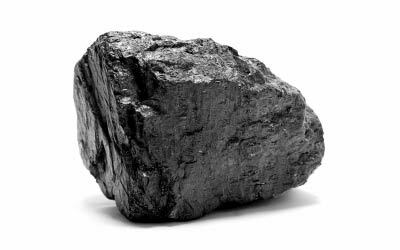 Charcoal can be used in the reduction of iron ore, in pharmacy, in the household … As a raw material for charcoal can be used wastes, whose export from the forest would not be cost-effective. Carbonization can be arranged on the ground (vertical and horizontal kilns), in pits in the ground, or in iron retorts. Volume: 3.5 / 7 m3. The shapes are rounded inverted pyramid. 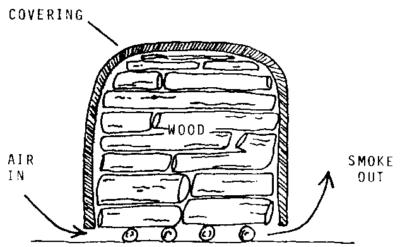 Two or three logs are placed at the bottom, and in their extension logs are placed on the front slope. These logs separates sorted wood from the ground. In the sorting takes into account that the wood does not touch the side of the slope. With leaves of ferns and straw, sorted wood is covered, and with the same material to fill the gaps. 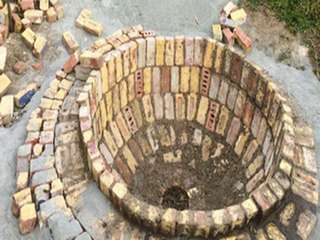 Charcoal kiln is covered layer of soil that is mixed with sand and coal dust (about 15 cm). Needs to leave two openings at opposite ends – one for ignition and the other for the discharge of gases. When burning firebox is closed. Carbonization is complete when the flame emerges on the other opening – and then this opening closes. Carbonization takes 5-6 days, and obtained 200 kg of coal per 1 m3 of wood. There are several types, usually cylindrical, consisting of segments – rings (5) and covers, the diameter of 2 m, a height of 1.8 m, sheet thickness 3 mm, with longitudinal ribs for reinforcement rings overlapping each other, from the above comes the cover. 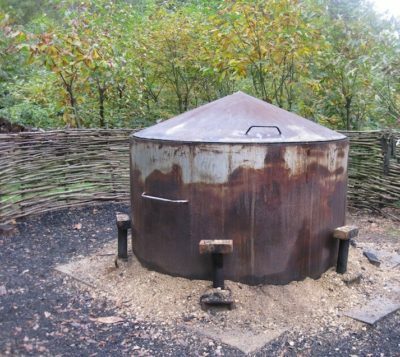 The second continuation from below has a door for fuel (30×30 cm), on the other segments are located at 3 perforated hole, on the cover is the chimney height of 30 cm and a diameter of 30 cm. Stationary – small and medium capacity, usually in the shape of a cylinder, with a vault in the form of a truncated paraboloid. The cylindrical section height is about 1 m, the total height is about 2.5 m and inner diameter is 3 m, wall thickness is equal to that of a brick, at the bottom has a door 50×50 cm. Brick charcoal kilns have a chimney. Charging is carried out from the side and from above, can fit 7-8 m3 of wood. Ignition is carried out from above, with a pre-pouring gasoline. Carbonization lasts for 7-9 days, and the process takes one worker. Cooling takes 2-3 days. This gives about 160 kg per 1 m3 of wood.